(May 4, 1945) -- Mr. and Mrs. John A. Kotwica of Laura Avenue have received a telegram from the War department saying that their son, Pvt. 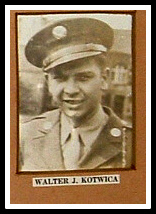 Walter Kotwica had been killed in action April 17 in Germany. Kotwica attended Nutley High School and was employed at Windheim Plumbing and Heating Company on Franklin Avenue prior to entering service in January 1943.Kotwica was with the Medical Corps of the 157th Infantry Regiment, 45th Division, Seventh Army. After breaching the Sigfreid Line in mid-March, the 157th Infantry Regiment and its sister regiments, the 179th and 180th, conducted assault crossings of the Rhine on March 26. The next day, the regiment crossed the main on a railroad bridge and found itself involved in close-quarters fighting against bitterly resisting SS troops in the city; all three battalions were committed to the attack. The fierce fighting, including a pitched battle for the town castle, went on until the city fell on April 3, 1945. Pvt. Kotwica was overseas since May 1943. He had been stationed in England until he was sent to France and then into Germany. Born in Harrison, he was brought to Nutley as an infant. According to the ABMC, Pvt. Kotwica died March 29, 1945. He is buried at Plot D, Row 23, Grave 42, Lorraine American Cemetery, St. Avold, France.